Rewards Canada: February 25 Update: New Holiday Inn Express in St. John's, Alaska Mileage Plan redemptions on Hainan coming on March 30th! February 25 Update: New Holiday Inn Express in St. John's, Alaska Mileage Plan redemptions on Hainan coming on March 30th! Here is your Tuesday update! InterContinental Hotels Group opened up a new hotel in St. John's last week. 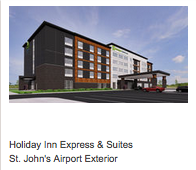 The Holiday Inn Express & Suites St John's Airport is now open for business! If you want to redeem IHG Rewards Club points for stays at this new location it will cost you 20,000 points per night. Find out more about this hotel here. The hotel features an indoor pool, 24-hour fitness and business centers as well as 1,800 square feet of meeting space that can comfortably accommodate up to 115 people. Guest rooms feature SMART TV’s with Netflix, Facebook, and YouTube apps pre-loaded, USB charging stations in all lamps and desk areas, modern décor with local artwork, comfortable queen or king-sized beds, a sitting area with a lounge chair and an in-room coffee machine featuring complimentary coffee. The complimentary Express Start™ breakfast bar offers a full range of breakfast items including a variety of healthy options, such as Oikos® yogurt, whole wheat English muffins, Kellogg’s® breakfast cereals, Quaker® oatmeal and a toppings bar for yogurt, cereal and pancakes. Additionally, the breakfast bar offers a wide variety of options including a rotation of egg and meat selections, fruit, the brand's proprietary cinnamon roll and Smart Roast™ 100% Arabica coffee. KLM has released a great business class promotion for flights over the busy summer season! You can fly in stlye to Europe and beyond for as little as $2799 all in! t. Book by Mar 9 for travel Jun 1 - Aug 31! Find out more here.